I’m pleased to inform you of a new white paper fresh off the press on Questionmark and Microsoft Office 365. This white paper explains how Microsoft Office 365 complements the Questionmark OnDemand assessment management system; and how you can use Office 365 to launch Questionmark surveys, quizzes, tests and exams, how to consume Office 365 resources within Questionmark, and how Office 365 can help analyze results from assessments. You can download the white paper here. The white paper also describes some of the reasons that organizations use assessments and why it is important for assessments to be valid, reliable and trustable. Use SAML to have common identities and seamless authentication between Office 365 and Questionmark OnDemand. The benefit of this is that test-takers can login once to Office 365 and then can take tests in Questionmark OnDemand without needing to login again. Assessments of competence are in general more accurate when the questions simulate the performance environment being measured. By putting video, sound, graphics and other media within question stimulus, you help put the participant’s mind into an environment closer to how he/she will be when doing a real-world job task. This makes the question more accurate in measuring the performance of such tasks. To help take advantage of this, a common use of Office 365 with Questionmark OnDemand is to make media and other resources that you can use within assessments. The white paper describes how you can use Office 365 Video, PowerPoint, SmartArt and other Office 365 tools to make videos and other useful question content. People have been using Microsoft Excel to help analyze assessment results since the 1980s and the white paper describes some suggestions on how to do that most effectively with Questionmark OnDemand. Newer Microsoft tools can also be used to provide powerful insight into assessment results. Questionmark OnDemand makes available assessment data in an OData feed, which can be consumed by business intelligence systems like Power BI. OData is an open protocol to allow the creation and consumption of queryable and interoperable data in a simple and standard way. The white paper also describes how to use OData and Power BI to get further analysis and visualizations from Questionmark OnDemand. The white paper is easy to read and gives practical advice. I recommend reading this white paper if your organization uses Office 365 and Questionmark or if you are considering doing so. You can download the white paper (free with registration) from the Questionmark website. You can also see other white papers, eBooks and other helpful resources at www.questionmark.com/learningresources. There’s not just one way to integrate Questionmark with your SharePoint portal. There’s not just two ways. There are actually three ways to integrate a Questionmark assessment into a SharePoint page! For Perception (on-premise) customers, it’s possible to use Windows Authentication to present to a SharePoint user a list of assessments for which they have been scheduled – without having to re-authenticate the user in Questionmark. Questionmark has also developed a SharePoint Connector for our OnDemand customers. It’s a SharePoint web part that automatically logs the user into Questionmark and displays a list of assessments for which they have been scheduled. The third way to integrate a Questionmark assessment with a SharePoint page is to embed it in the page. This is great for simple, anonymous quizzes and knowledge checks. 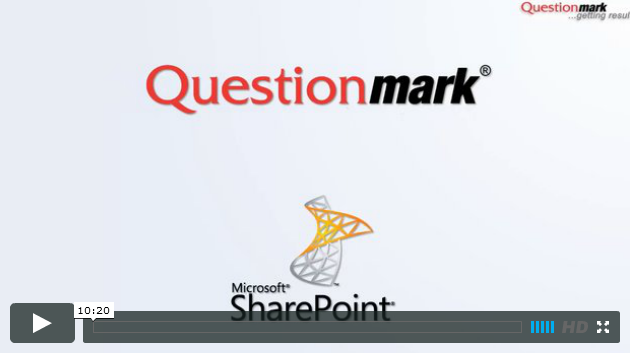 Check out this video for a quick overview of all three methods of integrating Questionmark and SharePoint. Social networking, wikis, blogs, portals and collaboration tools play an increasingly important role, offering powerful ways to increase participation and sustain momentum in learning. Enterprise portal applications such as Microsoft SharePoint offer content management and facilitate information sharing across boundaries. According to Bill Finegan, Vice President of Enterprise Technology Solutions at GP Strategies Corporation, the “portalization” of learning and development enables workers to gain the knowledge and skills they need to succeed, using technologies they engage with every day. How can tools like these fit in with your organization’s learning needs? And how can you make them work effectively together? Now available on SlideShare, this presentation explores the elements of a dynamic learning ecosystem and explains out how to combine SharePoint, Questionmark and other technologies to provide a learning environment suitable for today’s workers, This is just one example of what people learn about at our Users Conferences. Registration is already open for the 2014 Users Conference March 4 – 7 at the Grand Hyatt on the beautiful Riverwalk in San Antonio, Texas. Plan to be there! Social networking, wikis, blogs, portals and collaboration tools offer powerful ways to increase participation and sustain momentum in learning communities – but how can these tools be blended to create strong learning ecosystems? Enterprise applications such as Microsoft SharePoint can play a powerful role here, through content management and information sharing. I talked about this the other day about this with Bill Finegan, who is Vice President – Enterprise Technology Solutions at GP Strategies. He is an expert on information systems and operations management, with a heavy focus on learning technology. Bill will be explaining Best Practices for Leveraging SharePoint in your Learning Infrastructure at the Questionmark Users Conference March 3 – 6 in Baltimore. His presentation will help people who are trying to map out their strategy for the evolution of their learning technology as well as technical professionals who are interested in discussing how to link systems together. How are enterprise portal applications changing the learning landscape? What we’re seeing in larger organizations is the need to move to what I tend to call a composite application approach (a mash-up), where the different enterprise applications are being linked to from one landing site, one location, one major hub. This is allowing learners to get to their learning from the company portal site, one consolidated spot. It’s allowing organizations to tie learning into other enterprise applications such as SharePoint and enterprise Learning Applications like SuccessFactors, SumTotal, and Questionmark — something they haven’t been able to in the past. I’ve heard you refer to the “portalization” of eLearning. Could you talk about that development? We’ve seen it from two angles. One is the Learning Management Systems attempting to make themselves into that overall portal. You’ll see such as interfaces as the latest version s of SuccessFactors, SumTotal, Moodle, etc. They may have a portal look and feel with links out to different applications. That being said, a lot of our customers are layering products like SharePoint on top of the LMS to have easier operability. Suppose they were using SuccessFactors as the LMS and Questionmark for assessments. They would leverage SharePoint as their intranet. If they had an existing intranet site, they would allow a subpage for learning, to give a more design-centered approach. With most LMSs going to a software-as-a service (Saas) environment, the portal allows a more personalized look and feel while not interfering what you are doing from SaaS perspective (no customizations, etc.) and allowing for cleaner upgrades and so on. How can organizations makes sense of all these different possibilities? By deciding on their approach to collaboration and their overall approach to social learning. Are they looking for a Facebook-type approach? An Amazon-type approach? What systems do they want to use, and how do they want to connect the dots? If they have five different systems but don’t want to go to five different pages, how do they want users to get where they need to go? Do they want to integrate through their LMS? Of do they want to put a portal on as the interface to their systems and use it to provide discussion threads and other collaboration tools? How do you envision SharePoint, Questionmark and other systems working effectively together? I view it as allowing for Questionmark functionality to get linked from and applied at a “presentation-level” perspective from SharePoint for notifications of available assessments — and to allow Questionmark to be the assessment engine underneath the portal. The portal would work the same way with other applications. The main learning technology applications become the proverbial “engine underneath the hood,” powering the systems in place but allowing for a more flexible and intuitive interface. That Questionmark is ready for portalization, that portalization fits in with integrating Questionmark cleanly with other learning technical applications and that Questionmark and SharePoint can fit together in an overall mash-up/composite application approach. You can learn more at the conference about this and choose from more than 30 other presentations. Register online today! If you’re following this blog, you will have noticed many presentations, conceptual videos, tutorials and demos about all sorts of assessment-related subjects. Now you can access these resources all in one place: Questionmark’s new and improved Learning Café! 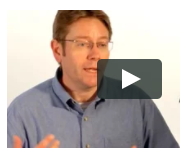 Learning Cafe includes more than three dozen videos, demonstrations and other resources about everything from assessment-related best practices to the use of Questionmark technologies. We will continue to add more resources, so keep checking back to see what’s new. How can you assess the effectiveness of informal learning? Lots of people ask me how you can use assessments to measure the effectiveness of informal learning. If people are learning at different times, in different ways and without structure, how do you know it’s happening? And how can you justify investment in social and informal learning initiatives? The 70+20+10 model of learning is increasingly understood – that we learn 70% on-the-job, 20% from others and 10% from formal study. But as people invest in informal learning initiatives, a key question arises. How do you measure the impact? Are people learning? And more importantly, are they performing better? You can use surveys to evaluate attitudes and reactions – either to specific initiatives or to the whole 70+20+10 initiative. Measuring reaction does not prove impact, but yields useful data. For example, surveys yielding consistently negative results could indicate initiatives are missing the mark. You could also look at the Success Case Method, which lets you home in on individual examples of success to get early evidence of a learning programme’s impact. See here and here for my earlier blog posts on how to do this. Of course, if you are using Questionmark technology, you can deliver such surveys embedded in blogs, wikis or other informal learning tools and also on mobile devices. There is strong evidence for the use of formative quizzes to help direct learning, strengthen memory and engage learners. You can easily embed quizzes inside informal learning, e.g. side by side with videos or within blogs, wikis and SharePoint, to track use and understanding of content. With informal learning, you also have the option of encouraging user-generated quizzes. These allow the author to structure, improve and explain his or her knowledge and engage and help the learner. You can also use more formal quizzes and tests to measure knowledge and skills. And you can compare someone’s skills before and after learning, compare to a benchmark or compare against others. Of course, in 70+20+10, people are learning in multiple places, at different times and in different ways. So measuring informal learning can be more difficult than measuring formal, planned learning. 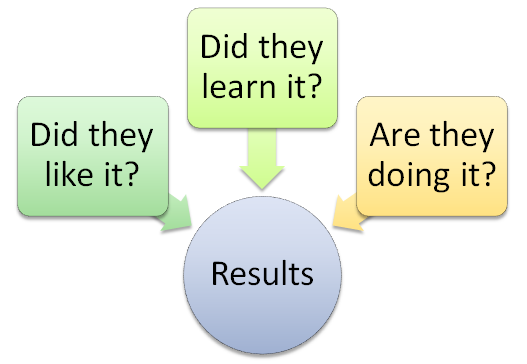 But if you can measure a performance improvement, that is more directly useful than simply measuring learning. 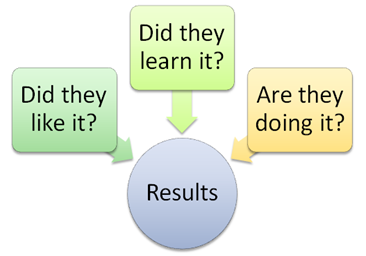 A great way of measuring performance is with observational assessments. This is described well in Jim Farrell’s recent post Observational assessments- measuring performance in a 70+20+10 world. To see the Learning Technology presentation on SlideShare, click here. 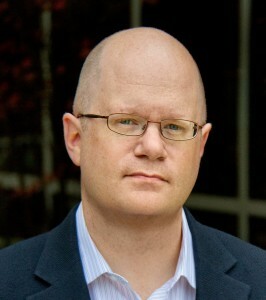 For more information on Questionmark technologies that can help you assess informal learning, see www.questionmark.com.